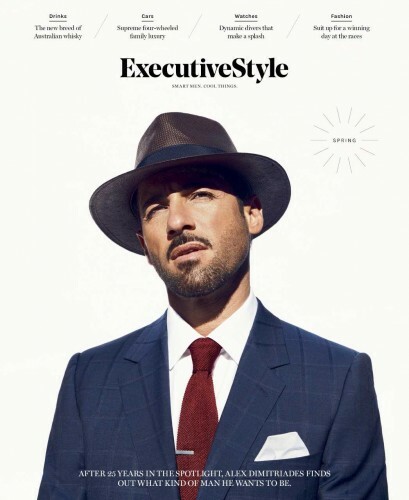 Fairfax Media’s luxury lifestyle website Executive Style is launching a new quarterly glossy men’s magazine, free inside The Age and The Sydney Morning Herald starting this Friday. Executive Style Magazine has received strong support from international luxury and watch brands, retail, luxury auto and travel clients, with launch partners including Audi, Blancpain, Bvlgari, Cartier, Giorgio Armani, Harrold Luxury Department Store, Hugo Boss, MontBlanc, Rolex and Victorian Racing Club. The 52-page launch edition features actor Alex Dimitriades on the cover, plus interviews with ex-AFL legend Jimmy Bartel and up-and-coming stars Benjamin Rigby [Alien: Covenant] and Osamah Sami [Ali’s Wedding]. The Spring issue includes the latest news on high-end cars, diving watches, Australian whiskies, Mick Fanning’s award-winning Balter beer, plus a sleek Father’s Day gift guide and a four-page fashion feature on what to wear to the Melbourne Cup Carnival. “Executive Style Magazine complements our current female premium lifestyle titles including Sunday Life and DailyLife.com.au, making our premium male offering truly cross-platform, with opportunities for digital, print and event executions targeting an AB male-skewed audience,” added Corbett. Fairfax Media has a long history of relationships with luxury advertisers. In 2015 the publisher was first to market in launching Fairfax Prestige Group which manages The Australian Financial Review Magazine, Life & Leisure, BOSS, AFR.com, Sunday Life, ExecutiveStyle.com.au amongst others. It also recently celebrated 10 years of the AFR Magazine Watch lift-out.